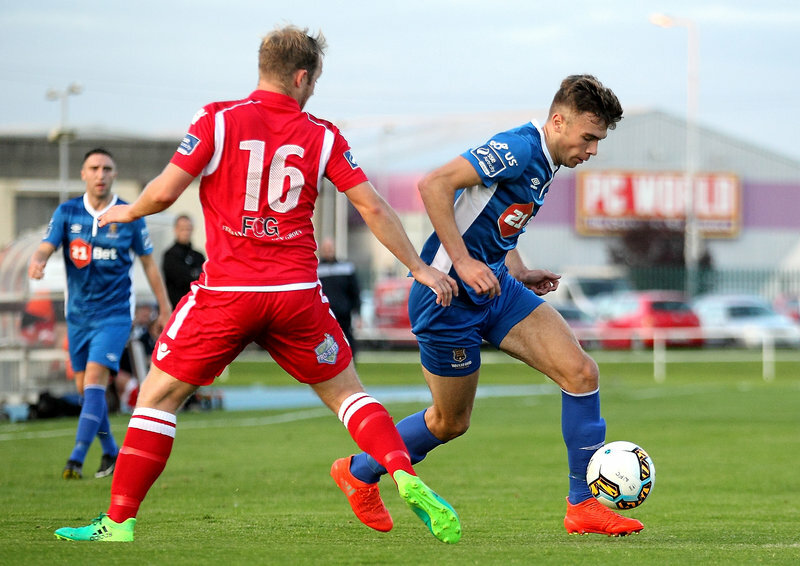 Waterford FC were held to a 1-1 draw against Shelbourne in their league clash played at the RSC on Friday night. The Blues were dominant in the second half after going behind in the first period, but despite having chances to win the game, the 1,284 home faithful had to be happy with a share of the spoils. Waterford had a golden chance to take the lead with two minutes on the clock when assistant referee Michelle O’Neill flagged that Mark O’Sullivan was fouled in the area and referee Alan Carey pointed to the spot, but David McDaid missed from the spot as he blazed over. The home side were punished for that miss as the visitors struck the front on five minutes. Adam Evans pick up possession of the ball on the right-side of the area after a long ball out of the defence, and he beat keeper Matthew Connor with a left-footed strike at his near post from 14 yards. Connor came to his sides rescue to deny the Tolka Park outfit their second goal on 20 minutes when Mark Hughes did well to the get better of his marker but his low right-footed shot was saved at his near post. Adam Evans nearly scored his second goal of the game on 31 minutes when the pacey attacker got free on the right-side but his shot was again turned out for a corner by Matthew Connor. The Blues got themselves back on level terms just three minutes into the second half. 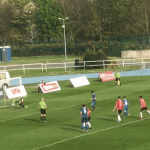 Paul Keegan whipped in a superb corner kick from the left that put keeper Dean Delany under pressure and Aaron Drinan got the final touch to knock the ball over the line. The Blues had a brilliant chance to get their noses in front on 57 minutes when Mark O’Sullivan sent John Martin into the clear on the left-side of the penalty area but Shelbourne keeper Dean Delany stood tall to make a super save. 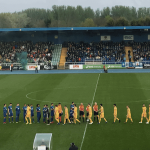 Garry Comerford went close to putting the Blues in front when Aaron Drinan’s cross from the right saw O’Sullivan knock the ball into the path of the midfielder, but his header from eight yards flashed inches over the crossbar. A piece of genius from Waterford’s Sander Puri on 81 minutes nearly carved out the lead goal for his side when the Estonian International took a pass from Aaron Drinan, who picked up a long throw from Matthew Connor, but his stunning strike from the right-side of the area came crashing back off the far post with Delany beaten. Matthew Connor made a fine save to deny James English soon afterwards before Puri had a great chance to win the contest for the hosts in the final minute of the half when he got on the end of a right-wing Dean Walsh at the back post but, on the stretch, the winger couldn’t find the target.